Consider The Sauce is skeptical about apps. Sure, since belatedly joining the smart-phone world, I make daily use of a variety – gmail, wordpress, ColorNote, the ABC, my credit union. But when it comes to our zeal for exploring the world and new things in it, apps – it mostly seems – are all about limiting choices and discoveries. After all, apps are a closed world – you are limited to what the app creators/owners have included. And then, of course, there’s the familiar joke – an app is someone wanting to sell you something. However, we have been won over by Menulog. Really, this app and the attendant service are beaut. And we offer that endorsement freely and with no support or inducements from the company. 1. Partner with other bloggers (I can give you some contacts if you want). Run a competition (do you need free prizes? Just let me know). Give back to the community: review your local restaurant and help them to promote their name (I can organize a free meal from them for you). So we have come to appreciate Menulog all on our own. We’ve found the service and its cost and processes pretty much faultless. OK, once – a few weeks ago – the delivery guy failed to include a can of soft drink. Getting food delivered is not something of which we’re REALLY big fans of – we much prefer getting out and about; meeting the people who make the food we love makes it taste so much better. But sometimes it is just the ticket. Inner-west favourites we’ve used Menulog on so far are Kitchen Samrat, Mishra’s Kitchen, Kenny’s Yum Cha House, Rizq Bangladeshi Cuisine, Motorino and Krishna Pait Pooja. 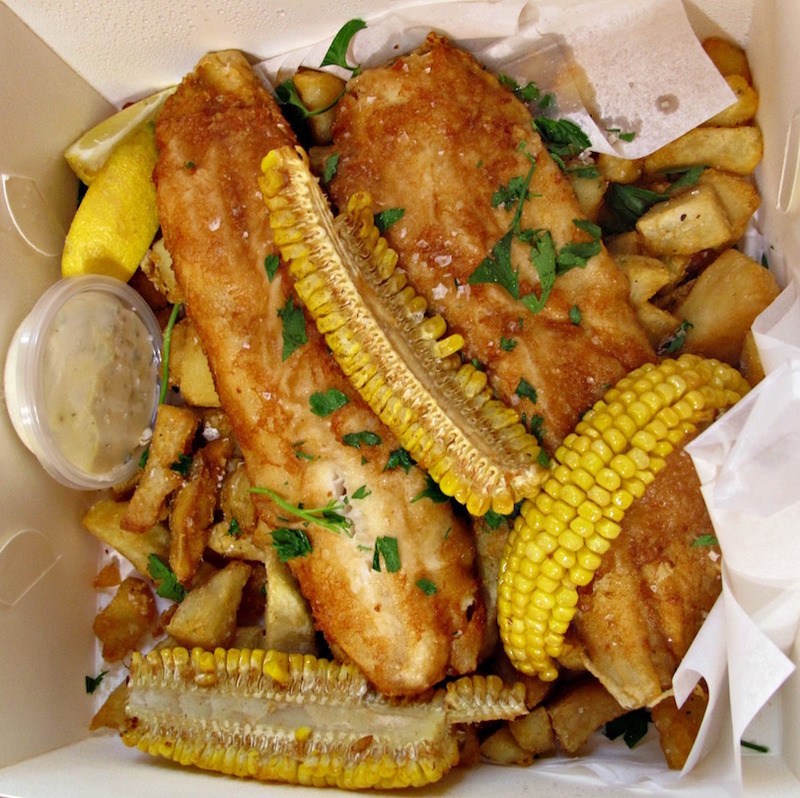 For this lazy Friday night, we’re taking a Menulog punt with one of our favourite westie fish and chip places – Dough! in Newport. We’re usually rather fastidious about always wanting to eat F&C we’re they’re made – so we’re a little nervy about what sort of nick our meal will be in by the time it arrives. Our fears turn out to be completely unfounded – our food has, it appears, gone straight from the deep-fyers into a car and thence driven straight from Newport to Yarraville. Everything is hot and fresh. Two two big, handsome slabs of battered fish are wonderful. Two serves of BBQ corn at $1.20 each turns our to be three slivers – they’re fine and juicy but it’s not clear how BBQ-ing has been going on with them. Those legendary rough-cut, warts-and-all chips? “Wow – these chips are so great!” quips Bennie. These are terrific fish and chips – and our meal has turned out to be much the same price (and better) as if we’d walked around the corner to Anderson Street. 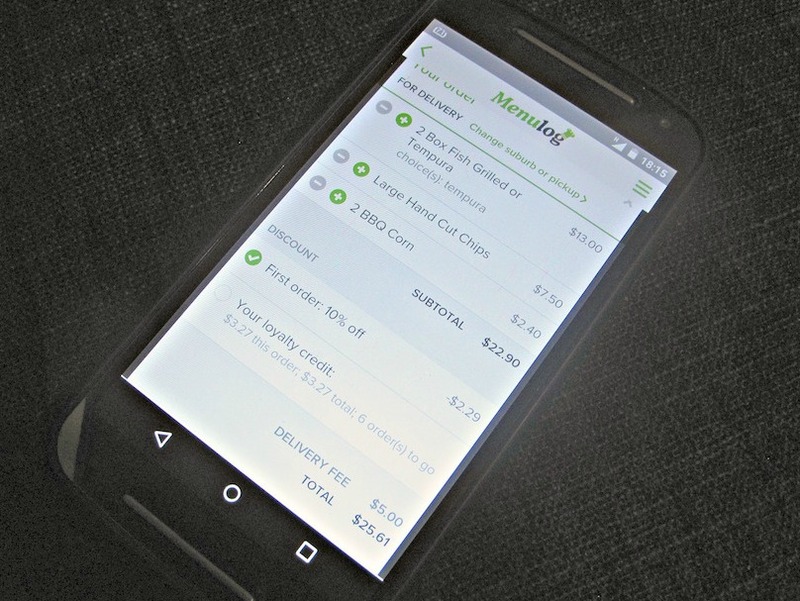 With a $5 delivery fee and a 10 per cent discount for a first-time order, the total is $25.61. Forgetting about the corn and getting a small serve of chips (which would’ve been ample) would get that price down to a very splendid $21.15. Ordering a home-delivered meal from Dough! has also seen us not left to deal with the plastic containers that go with all other delivered food, save for pizza. I wonder if the delivery drivers, in general, are caught up in the same onerous work/pay/conditions situation as convenience store workers and Myer cleaners. I’m very interested in some reader feedback on this. If so, what have been your westside winners? What – if any – have been the disasters? Hi Mal! Ha! Shows how much of a newbie I am – hadn’t even heard of eatnow. Interesting – the eatnow line-up offered for 3013 appears to be identical to that of Menulog. Thanks! Yes we’ll start tipping.